Saturday, July 19, 2008 - 6:00 p.m. 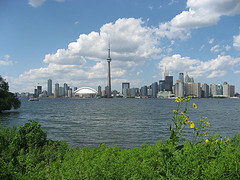 Discover Toronto during this hour-long fun-filled activity (plus travel time). Your team will navigate, at your own pace, to find locations on a map. This ISMB tradition is a variant of the sport of orienteering, and an instance of an NP-complete problem! An opportunity to get outdoors, to meet your colleagues and to enjoy some exercise. Friends and family are encouraged to come along. Full details will be available closer to the event. Plan now to attend! A fun night in one of Toronto's historic buildings. Evening includes local entertainment, dinner and an after dinner dance party. 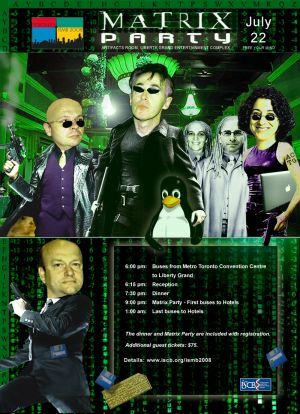 Reception: 6:15 p.m. 7:15 p.m.
Matrix Party: 9:00 p.m. 1:00 a.m. The dinner and Matrix party are included in conference registration and additional guest tickets can be purchased for $75.00 during the on-line registration process. Shuttle Service available to and from the Liberty Grand and Conference Hotels.